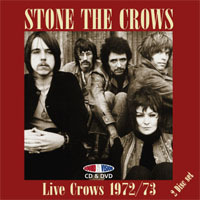 MAGGIE BELL and LESLIE HARVEY formed STONE THE CROWS in late 1969 and with LED ZEPPELIN Manager Peter Grant as their mentor they released some critically acclaimed studio albums over the next 4 years. Disc 1 (CD) was recorded at Montreux early in 1972 and captures the band at their tightest sadly this performance was only a few weeks before guitarist Harvey was tragically electrocuted during a sound check at The Wanage Ballroom, Swansea. The band regrouped that year with JIMMY McCULLOCH playing guitar and in 1973 recorded an ‘In Concert, Beat Workshop’ concert for German TV which is featured on Disc 2 (DVD9) and includes bonus features including interviews with Maggie and COLIN ALLEN. Classic blues rock – enjoy. A great blues/rock/soul outfit denied their rightful share of acclaim by events, for me there are echoes of Badfinger and their own tragic history. At least we can enjoy what both ensembles achieved. Montreux Festival has always been a place for many a great performance, and this one is no exclusion, having caught this magnificient British quintet at their deliciously rawest. Nobody knew then that by May Leslie Harvey, whose thick guitar slices drive this concert on, would be gone for ever. If not for the fatal electrocution, he may well have turned into a player of much large calibre. Harvey's mastery of the instrument shines in "Love", the band opting for the set comprised of material from the "Ode To John Law" album, more familiar to the audience than songs from the current "Teenage Licks". Formed in Glasgow in 1969 Stone The Crows were fronted by Maggie Bell, playing blues rock they were mentored by Led Zeppelin manager Peter Grant and released 4 albums before splitting up in 1972. This live CD/DVD set features 2 gigs- the first recorded in Montreux in 1972 and featuring guitarist Leslie Harvey who was electrocuted during a sound check just weeks later. The 5 songs here weighing in at a shade under an hour, these include 'Friends', 'Penicillin Blues' and the Bob Dylan penned 'Hollis Brown'. The DVD comes from 1973 and was recorded for Germanys Beat Workshop, tracks here include 'Going Down', 'Sunset Cowboy' and 'Good Time Girl'.